IQM CALC automatically imports every available DicomRT Plan file exported from your treatment planning system. 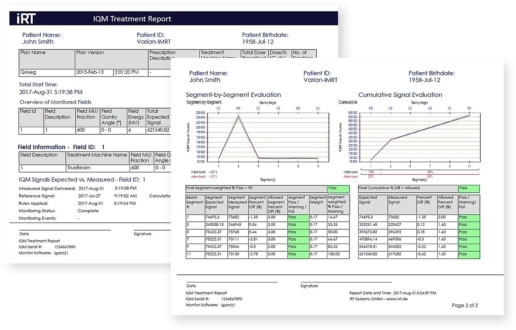 IQM CALC automatically creates a patient record or adds a new treatment plan revision to an already existing patient record in the IQM database. 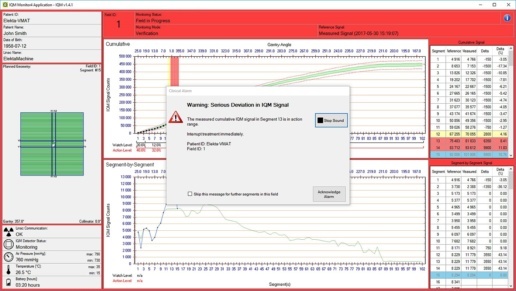 IQM CALC automatically calculates the expected reference signal for every beam segment. 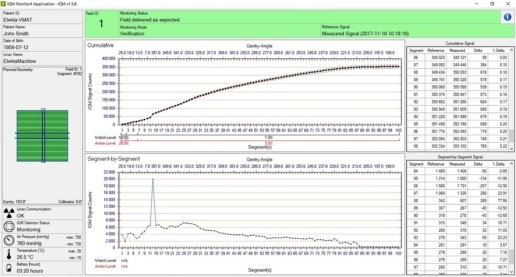 IQM CALC automatically stores the expected reference signal with the patient in the IQM database. Loading the patient at the Linear Accelerator automatically opens the same patient in the IQM database. IQM MON automatically loads available calculated or measured reference data. Beam by beam and segment by segment. 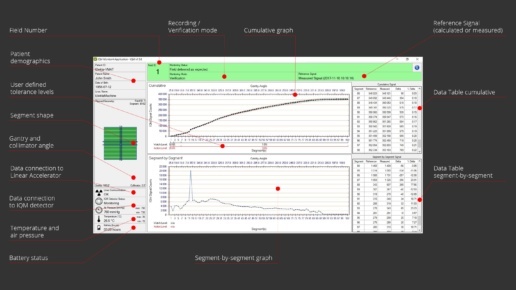 IQM MON displays the expected signal for each individual segment in the data tables as well as in the segment-by-segment and cumulative graphs. 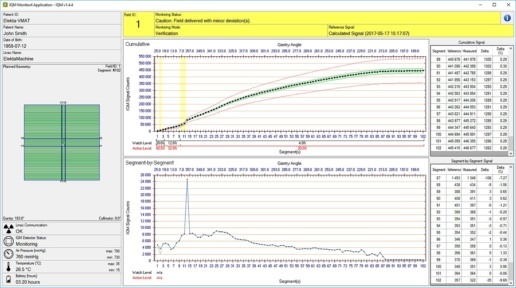 A smarter way to monitor your treatment accuracy. Monitoring treatment accuracy has never been easier. User-definable tolerance levels create verification corridors. Two corridors - three levels. The tolerance level represents the daily output fluctuation of your Linear Accelerator. The watch level shows acceptable deviations outside the normal fluctuation. The action level indicates a potentially harmful treatment delivery deviation. Segment-by-segment, beam-by-beam, fraction-by-fraction for every patient. Treating your cancer patients has never been safer. Real-time measurements.During the patient treatment. Real-time verification.During the patient treatment. All signals in tolerance level: treatment beam was delivered successfully. Treatment delivery verification in the background. Fully automated. Segment-by-segment. No user interaction required. IQM verifies that the treatment beam was delivered as planned. IQM confirms that your patient was treated as intended. Every patient. Every fraction. Without any additional workload. One segment was not delivered within the expected accuracy of your Linear Accelerator. IQM tracks every deviation. IQM tags every deviation. IQM informs you about every deviation. IQM provides end-to-end verification for complete quality control. For a new level of treatment verification accuracy. IQM immediately alarms you if a segment was delivered outside your acceptance level. Every segment. Every beam. Every fraction. Every patient. IQM protects your patient from receiving a potentially harmful dose. Error prevention for a new level of treatment safety. Your patients deserve it. IQM keeps you informed. No matter where you are. Daily treatment summaries. Alarm e-mails. Per-Fraction Reports. Configure IQM to send you the reports that you want. When you want them. Wherever you are. Access verification results. Anywhere. Anytime. Access your verification results from any computer in the department. IQM Review (REV) is a license-free application that allows you to access verification results from anywhere in your department network. Anytime. Review verification results for a specific treatment fraction. Compare verification results from multiple treatment fractions. Show deviations from reference. With one single mouse-click. Whenever you need it.